Police who shot a former gangster in the chest "acted in line with policy" and will face no further action, an investigation has found. Sharif Cousins was placed in an induced coma for weeks after being shot by a West Midlands Police officer in July 2017. The Independent Office for Police Conduct (IOPC) said officers had feared he was reaching for a gun. Mr Cousins said he was "unsurprised" by the findings. He claims his hands were raised at the time he was shot. Investigators reviewed body-worn footage from armed officers deployed to Hereford Close in Rubery, Birmingham. They were acting on intelligence reports of a gun and ammunition. Mr Cousins was confronted by officers in an alleyway with Jamael Scarlett, who was later jailed for drugs and firearms offences. In the footage, the IOPC found Mr Cousins "did not immediately comply" with an officer's command to raise his hands. He then "appeared to be reaching behind his back", the report said, which led the officer to suspect he was reaching for a firearm concealed in his trousers. "In our view the officer concerned believed that there was an immediate and genuine risk posed to him, and his colleague, when he made the split-second decision to shoot," IOPC Regional Director Derrick Campbell said. West Midlands Police said it would not be responding to the findings. 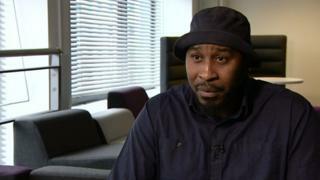 Mr Cousins, an ex-gang member turned youth worker, was unarmed when he was shot once in the chest and spent three weeks in a coma before recovering. No charges were brought against him in connection with the night of the shooting. In March 2018, he announced he was planning to take legal action against West Midlands Police, saying the force had targeted him, denied him first aid and mistreated him. The IOPC said the evidence it gathered "did not uphold" his complaints. Its findings had been finalised by the time Mr Cousins announced his intentions, but the watchdog waited a year before publishing its results because of "sensitive police operational details". Speaking following the release of the report, Mr Cousins disputed some of its findings and said he would continue to "fight for my truth and my rights". He said he would be meeting with his lawyer to discuss what further action could be taken against the force. He said he had PTSD and was still recovering mentally from the effects of the shooting. "My mind is stuck on a certain time frame and can't get past it, basically I just don't like going outside the house," he said. "I am on super-high medication just [to] cope with day-to-day life. "It is hard, but what gets me through it is my family and my kids. "At the end of day, I know I made lot of silly decisions in life when I was younger, a lot of them I'm paying for now I'm older. If I could take [it] all back and repeat I would, I was young and childish, but it shouldn't really be hanging over me all of my life."